Bath time around our parts are quite a mission. I mean, for starters, there are now two squirmy little bodies to clean and the two-year age gap means nothing because the littlest one is just as active as the bigger one is. They just don’t sit still! We still have fun, none the less. Kari loves introducing Jo to our “lotions and potions” regime. She got really into it, the other day, when I added Bubiroo to our regular pamper session. You guys, Bubiroo has really impressed me! I mean, besides for the fact that owner, Dorae, is an actual qualified Naturopath and Homeopath (so she knows what she’s doing, yo). The Bubiroo product is 100% natural, handmade with love, and free of all the junk you would find in commercial baby products. That’s right, it’s preservative free and does not contain chemicals, artificial fragrances or coloring, mineral oils, parabens, petroleum sulfates or nut oil. And guys, I know you usually expect to spend a lot on all natural products but these are really well priced! The baby wash and shampoo contains marula, mandarin and may chang and smells really clean. (I know, I’m so descriptive). 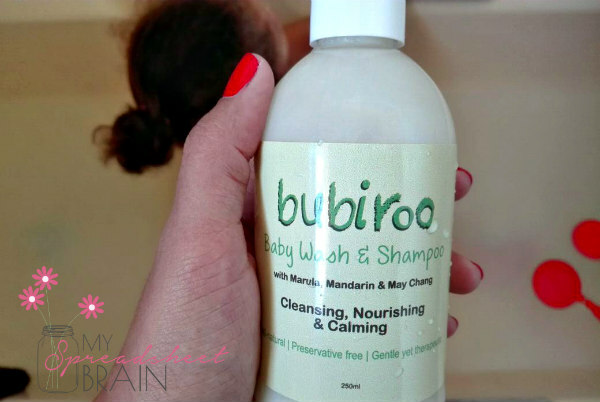 What I mean is that most baby washes has a sweet scent, but I liked that the Bubiroo wash is almost fragrance free. It also doesn’t foam like normal washes because it does not contain sodium laureth sulfate. 100% goodness! I haven’t tried it out on Kari’s mop of curls, but it did the job on Jo’s hair. His hair did not feel coarse or sticky afterwards (as I expected it to). The baby wax is the best thing in the world! It contains a whole bunch of amazingness such as coconut oil, beeswax, shea butter, calendula oil, ylang ylang, marula seed oil (and the beat goes on). The consistency is a bit hard to the touch (because of the coconut oil), so you would need to warm it up by rubbing some between your hands, before applying. It’s such a great product for baby massages and rubs. I am a huge fan! Kari enjoys digging into it and rubbing the wax between her little hands. It’s actually a double score for me, because I don’t have to worry about copious amounts of lotion being slathered all over my bedding! 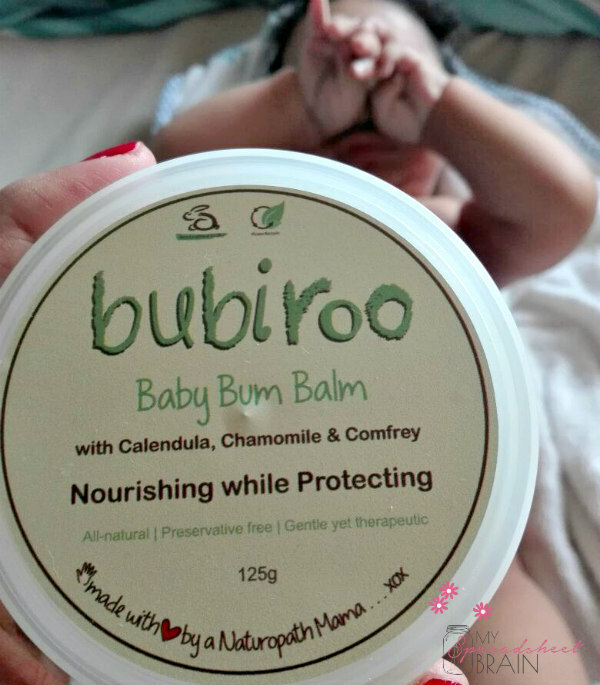 The baby bum balm is probably one of my favorite Bubiroo products. Jonah has fortunately been nappy rash free so I’ve never felt the need to cover his little bottom with thick, overly medicated bum creams. I mean, I want his skin to breath, while still being protected. This is the perfect product for that. And again, because it contains coconut oil you need to warm it up first before application, but once applied it goes on like a thin layer of ointment and smells great! Talking about ointment, Kari refers to the Bubiroo products as her “ointment” because she loves the smell and she says it makes her “better”. And how right she is! 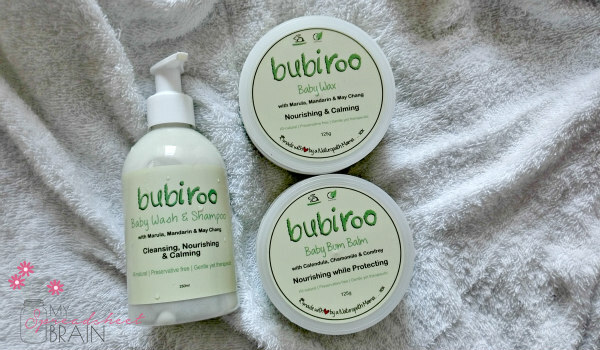 If you’d like to get your hands on some Bubiroo products check out the Facebook page for more information or drop them an email. Moms, if your kids have overly sensitive skin, chat with Dorae. She’ll put together a product tailor made just for you and your kid!